I got a little lucky last night. 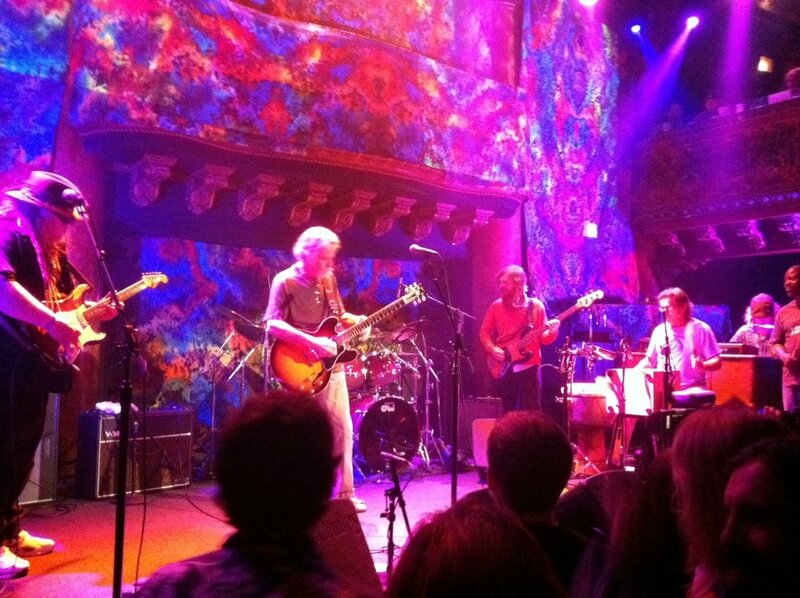 I knew I wanted to see 7 Walkers, Bill Kreutzmann's band featuring Papa Mali, at the Great American Music Hall. And I heard there might be special guests from Kreutzmann's old band. So I was delighted to see Mickey Hart come out for the first set along with talking drum virtuoso Sikiru Adepoju. As far as I'm concerned, watching Kreutzmann and Hart drum together is proof positive that I've wasted my life. Utterly. Getting into that groove and staying there for 50 years sounds (and looks) pretty good to me. And guest bassist Reed Mathis from Tea Leaf Green looked like he was having fun, too. But there was also the extra microphone in the middle of the stage. Could that be for another special guest? The answer came when Bob Weir shambled out a few numbers into the first set. And then Maria Muldaur. It was the first time since 2009 that the three former Dead members appeared together. The first set included "Mister Charlie," "New Speedway Boogie," "Big Railroad Blues," "Bird Song," "Wang Dang Doodle," "Deal," "Sugaree," and a cover of "Fever." It was an embarrassment of riches for the average fan, who could stroll up to the window, plunk down $25, and amble up to the front of the stage. I really dug Papa Mali, by the way. No need or desire to compare him to Garcia, but his gator-bait sound crosses very well with the Dead songbook. My back was killing me, the lingering result of an auto collision two months ago, so I had to decamp after the first set, but I'm looking forward to hearing about the second. In this wide-ranging book, Atwater recounts the state's unique record of hatching economic opportunity and innovation. He's alert to the state's remarkable physical geography and what Carey McWilliams called the authority of the land. And although Atwater's identification with California is strong--there's a boosterish quality to his portrait--he also considers the less uplifting aspects of the state's history and its present governance crisis. Like all dreams, the California one resists precise definition. Perhaps necessarily, it remains a little beneath or beyond consciousness. In some ways, though, the personal history of Arnold Schwarzenegger captures its key points: the immigrant who makes it big through bodybuilding at the beach (cf. McWilliams's "cult of the body"), then Hollywood movies, and then electoral politics. We even know Arnold's modes of transportation--the Hummer and the Harley--which no doubt reflect the state's obsession with mobility. When it comes to self-fashioning, California style, Schwarzenegger is a parade example. But many of the state's most intractable problems can be framed as conflicts between two or more aspects of the dream. Consider, for example, land-use showdowns. On the one hand, we believe in economic opportunity, and nothing has provided more of that than real estate development. But we've also inherited John Muir's preservationist ethic, which reveres wilderness. Or food: the organic, slow food culture of the North Bay (for example) exists cheek-by-jowl with the latest Frankenfood advances coming out of UC Davis, about 30 minutes east. Paradoxical, indeed. Atwater gets this as well as anybody. A fourth-generation Californian, he blends his personal experiences and observations with an armchair survey of the state's history and key themes. Along the way, he cites some of California's shrewdest observers, including Carey McWilliams, Kevin Starr, Mike Davis, Richard Walker, Luis Valdez, Joan Didion, Wallace Stegner, Josiah Royce, Jeff Lustig, Henry George, John Muir, James Houston, and Richard Rodriguez. Atwater never actually delivers on his promise to reconcile paradoxes and dream anew. And despite the book's reading line, this isn't a blueprint. It's a smart, deeply felt, and frankly hortatory essay, but it feels more like a warm-up for a still inchoate project that will make the most of his passion and erudition. May this first effort lead to many more. 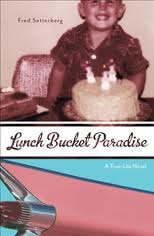 The good folks at Heyday Books sent along Fred Setterberg's Lunch Bucket Paradise, which I finished reading today. As the title implies, this "true-life novel" and coming-of-age story depicts a particular kind of hog heaven: the East Bay suburbs between World War II and Vietnam. Some of this ground has been covered (though quite differently) by San Lorenzo native Curtis White in his first novel The Idea of Home. Here our first-person narrator is the son of a Scandinavian mechanic at the Alameda Naval Air Station and an Italian (and very Catholic) housewife. The boy's rites of passage are queued up and handled in order: friends (and their scraps), catechism, yard work, Boy Scouts, gigs, girls, warehouse work, more girls, and finally the prospect of conscription. I'm a little belated--maybe ten years younger than Setterberg's hero--and raised a few miles north in El Cerrito, but I found the world of this novel familiar territory. If you remember Juan Marichal, Doughboy swimming pools, Archie comic books, Brylcreem, Rice-a-Roni, Rainier ale, and the pleasures of discovering James Brown (for me it was also Tower of Power), you'll probably relate to this fictive world, too. The novel isn't tightly plotted--several chapters were published in serial form, and it reads more like s series of connected but self-contained sketches. Its pleasures are hitched to the coming-of-age theme, first in the shadow of World War II and then in dread of Vietnam. There's also the specific and unmistakable sense of place. Finally, there's the post-war, California version of unterrified Jeffersonianism, perhaps best embodied by the boy's father, a self-educated, free-thinking family man who wants better for his son. It's not exactly the myth of the happy yeoman, but it's pretty close, and for me it has the ring of truth.